Football is a simple game, which can be played impressively just by doing simple things well, none more so than positioning yourself correctly. It’s one of the things that nobody ever seems to tell you, how to position yourself correctly, but it’s something that can make all the difference to your game. Body positioning is so important that it’s strange that it is so often overlooked. That’s not the case in John Cartwright’s footballing manual Football for the Brave (see link at the bottom of this article). It’s a brief book aimed at pinpointing the truths (or at least the philosophy according to Cartwright, an ex-professional footballer and long-time coach) on how the game should be played. “In places or situations we’re not familiar with we take special care to look more keenly about us – even over our shoulder – we are prepared for the unexpected! Most sports are played from a sideways position; this makes the movement to strike easier as well as to be well positioned to see as much of the pitch and surrounding area as possible. Sport requires performers to adjust their body positioning according to the actions required for quick, accurate responses. Playing on the half turn has a number of basic advantages. Firstly, it gives you a wider field of view. That wider field of view should make sure that you are aware of your surroundings and will allow you to avoid surprises. It should also allow you to react quickly, both because of your improved awareness, but also because physically your body is set in a position to react better. This positioning is important both when you are defending and attacking, with a slightly different emphasis for each. Here, player A is pressing the opposition player X, who is in possession of the ball. In this circumstance, the natural reaction for the defender might be to face the opposition player straight-on (looking straight up the pitch to the opposition goal). He sees more of the other players, giving himself a view of where the support is, both for the defence and the opposition. The sideways position allows A to be able to better react if X tries to knock the ball past him – it avoids A being caught flat-footed. 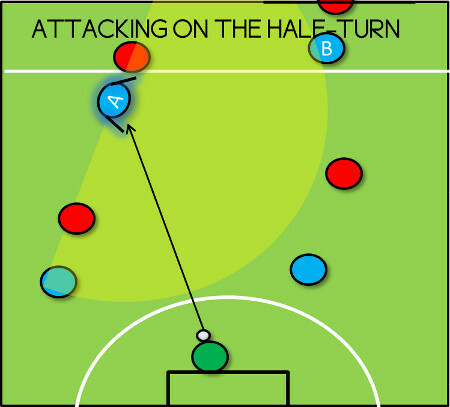 This position makes it very difficult for the attacker to move anything other than towards the middle of the pitch (since A is closing off the wing). 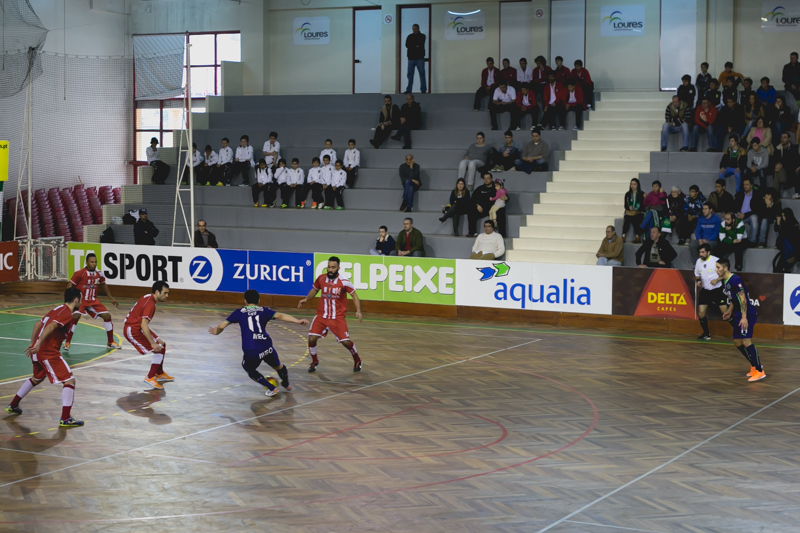 The other defenders can take useful guidance from this decision, planning their own position accordingly. Although showing the player this way does not allow A to have as much field of view as in the prior example, it might be the appropriate tactic if A considers that pushing the player wide is better than showing him inside (but beware of getting too tight in this situation if the opposition player is much quicker than you!). What is important is not so much that player A decides to go one way or the other, it’s that he maintains a half turn shape allowing him to be on his toes to jockey or sprint with the opponent in the direction A has chosen. Notice that the diagonal shape is also appropriate for player B, who is the supporting defender. This shape allows him to both view the ball and the opposition player he is marking (player Y), but also puts him in a position to react quickly to any runs that Y may make, or to get across and cover behind player A if X runs past him. Playing on the half-turn allows player B to receive information, calculate the options and react much better than the player who merely faces forwards. See where the space is, as well as where his supporting teammates are. Make a better decision on whether to hold / turn / pass or run with the ball. Have the information to know if a first time pass to player B is appropriate. Clearly in this scenario there are huge advantages of playing with this body-position as opposed to facing straight back towards the goalkeeper. You can comfortably say that for any of the 4 outfield players in blue, that each of them would benefit from playing on the half-turn, so that they have the same advantages of player A. The examples above should have convinced you that there are some big advantages of checking your body positioning when you play. It’s a simple change, but one that if you’re not used to doing it, can feel a little unnatural. The tag-line to John Cartwright’s book is “football isn’t simply a team game, it’s about individuals combining when necessary”. In his mind, to play the game well, a footballer needs to have skill. And skill doesn’t just mean technique – it’s more than that – it’s “pressurised technique”. Skill is not just about knowing a technique, it’s about how you use it in a game. Apparently this could be at the very heart of why England do so very badly in world cup competitions – we just don’t teach our players this stuff. Much of the inspiration from this article has come from that book. Playing as a ‘last man‘ – why and how your team should use a dedicated player in defense! 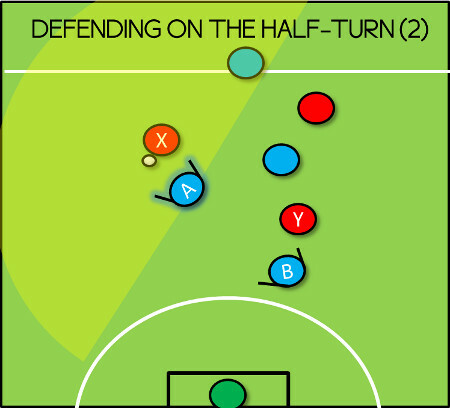 Playing against a better team – lots of defending tips here. You might play a better team, but that doesn’t mean you have to lose. Just wanted to say what a great article I think this is. As a player I find it so true that many coaches do not pay enough attention to this aspect of the game. Hi and thanks for the comment. I agree, this is such a simple principle that can make world of difference. Coaches should be drumming this into players from an early age. I have had a look at your blog; it’s excellent. Thanks for sharing.